Honolulu is the perfect place to start your adventure in Hawaii, the home of surfing, the hula and blissful beaches. The capital of this world-famous U.S state, it has volcano hikes, historic memorials, sweet nightlife and even sweeter surf beaches. 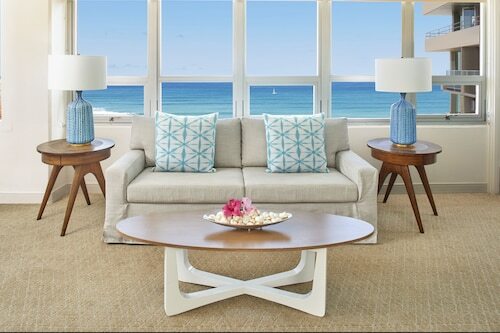 Hang ten or just hang out with our Honolulu hotels! 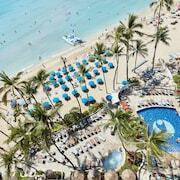 Honolulu is in Oahu, the most populated island in Hawaii, known as ‘the Gathering Place’. In 1845, Kamehameha III – the king of Hawaii - made Honolulu the capital. In the late 19th century, the U.S overthrew the monarchy and annexed Hawaii. In 1941, Japanese forces attacked Pearl Harbor, drawing the U.S into World War Two. Wot about taking in a sweeping 360 view of Honolulu with a hike up to the top of Diamond Head volcanic crater? Taking about an hour, this scenic path makes its way through scrub before heading inside a fort behind the crater walls and up a series of stairs and tunnels. The view from the top, which goes all the way to Maui, is well worth the effort. 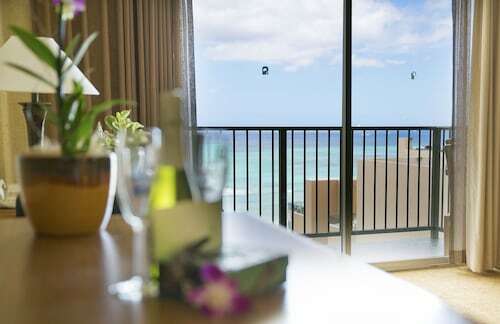 If you want something a bit more relaxing, chill out on one of Honolulu’s white palm-fringed beaches or take that surfing lesson you’ve been dreaming about in nearby Waikiki. Whatever you’re looking for, Honolulu can provide. History buff? Visit Iolani Palace, once the seat of the Hawaiian monarchy. Head to the USS Arizona Memorial in Pearl Harbor and take a look in the Pacific Aviation Museum. Craving nightlife? Downtown Honolulu has the historic Hawaii Theatre as well as bars with a variety of music, and Waikiki has enough nightclubs and music venues to make a hot night out in Hawaii complete. And if you’ve got a family to amuse, visit Honolulu Zoo, Waikiki Aquarium and Wet’n’Wild Hawaii, which has heaps of thrilling waterslides. Honolulu’s Ala Moana Centre is the world’s largest open-air shopping centre, with four floors, over 290 stores and 80 places to dine. 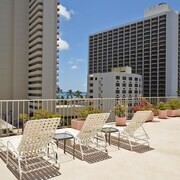 Luxury Row in Waikiki features high-end international fashion, and the Aloha Tower Marketplace has food and shopping on Honolulu Harbor’s waterfront. Oahu’s dining offers plenty of Hawaii Regional Cuisine, a style that emerged in 1991 and blends locally grown ingredients with international flavours. 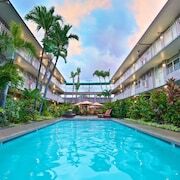 Our cheap flights to Honolulu will have you lying under the palm trees in no time, so book your Honolulu accommodation with us now and hula your way to happiness. 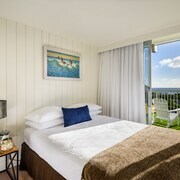 How Much is a Hotel Room in Honolulu? 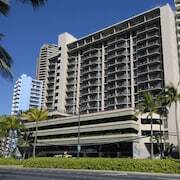 Hotels in Honolulu start at AU$153 per night. Prices and availability subject to change. Additional terms may apply. Great location, only one block off the beach. Friendly staff. Absolutely beautiful view and friendly staff. However ther was only on server for the restaurant and orders were taking a while.